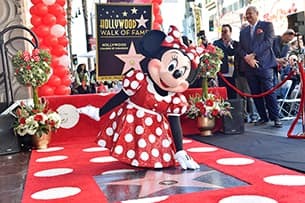 Earlier today, Minnie Mouse marked a milestone in Disney history by receiving a star on the legendary Hollywood Walk of Fame in Hollywood, California, in celebration of her 90th anniversary. 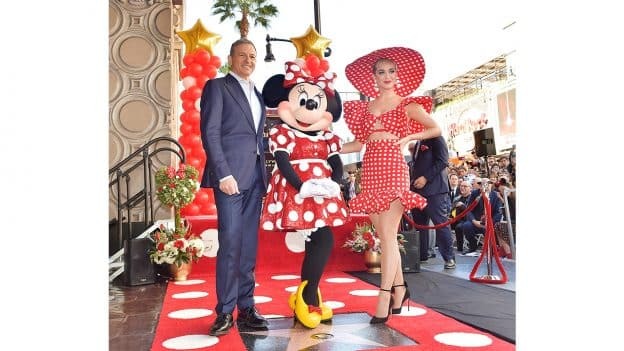 Disney Chairman and CEO Bob Iger and global pop icon and judge of ABC’s “American Idol” Katy Perry, presented the honor to Minnie Mouse in front of Hollywood’s legendary El Capitan Theatre. In addition to her films, Minnie Mouse has also entertained millions of guests at Disney Parks around the world since the first Disney theme park – Disneyland park – opened its gates in 1955. Minnie was able to celebrate her milestone achievement earlier this week with park guests at a special “Rock the Dots”-themed send-off at Disney’s Hollywood Studios at the Walt Disney World Resort. 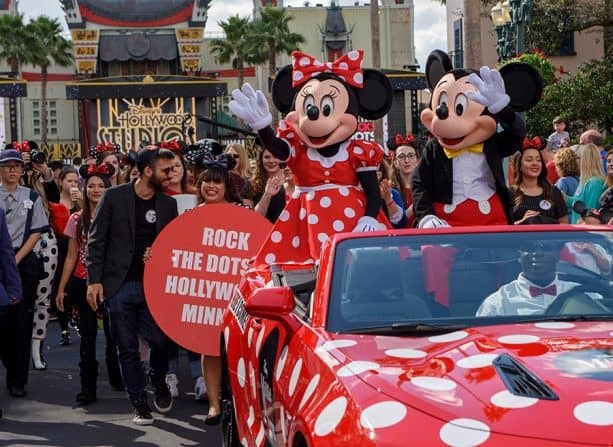 In it, Minnie Mouse joined her lifelong pal Mickey Mouse for a walk down a red carpet and a journey through the park on a special Minnie Mouse-themed car. A crowd of guests wearing attire inspired by Minnie’s iconic red-and-white polka dots lined up at the park to cheer them on. Before leaving for Hollywood, Minnie Mouse made one last stop over at Disney Springs to greet guests who were enjoying special “Rock the Dots” festivities in Minnie’s honor. Check out the video above for a look inside today’s festivities. 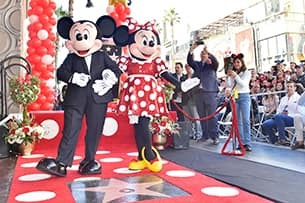 Hello there Disney Parks Blog I Just wanted to say Congratulations to Donald Duck, Minnie Mouse, Mickey Mouse and any other Disney Character that received there own Hollywood Star on the Hollywood Walk Of Fame!